When come to production term, the most items customers hunt for was “quality”. This wasn’t a surprise. It’s the reason we’ve invested in equipments like CM602-L Modular High Speed Placement Machine & DAGE’s X-RAY XD series to maximize output plus obtaining customer satisfaction. 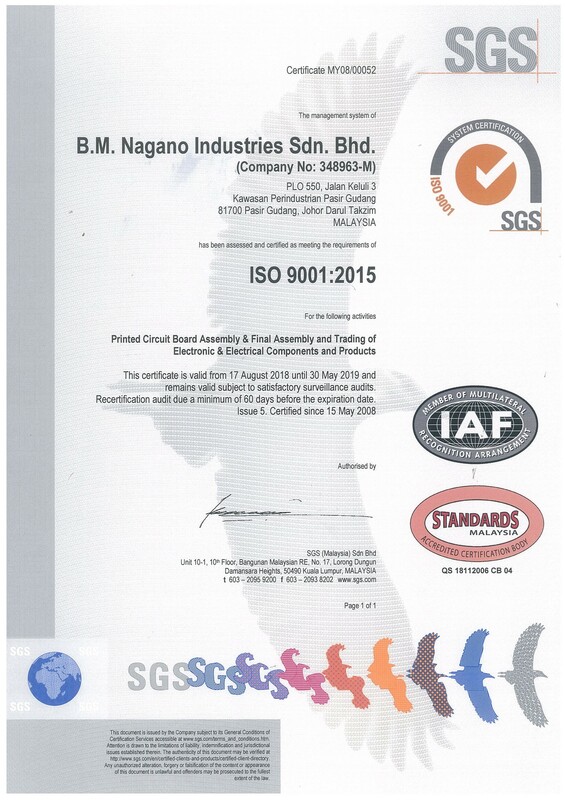 B.M.Nagano has been ISO 9001:2015 certified since 2008. We’re certified till 2019, and we’re sure to maintain & improve this status from time to time. Basically, it’s a set of principles for companies who concern about conveying high quality products and making their customers happy. BMM absolutely falls into that category; so ISO certification was an easy choice for us. BMM is ISO 9001:2015 certified through SGS for “Assembly of Handsets & Accessories and Trading of Telephone Component.” You can even verify our certification here. B.M. Nagano is proud to announce that we have achieved the internationally well-known ISO 14001:2015 certification for its commitment to environmental management. B.M. 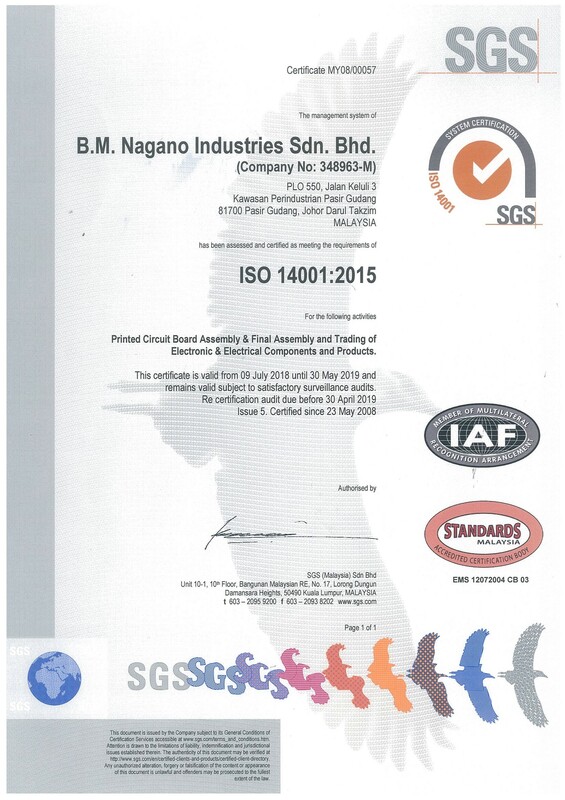 Nagano begin to have ISO 14001:2015 since 2008 & we still maintaining the status until now. The necessities of ISO 14001:2015, which sets out criteria for Environmental Management Systems, have been implemented into B.M. Nagano operations and will assist to improve environmental performance in areas including waste management, noise reduction, pollution control, air quality, ecological protection and energy efficiency. We are delighted to have achieved certified recognition of the environmental management system we have. We are committed to limiting the impact of B.M Nagano operations on the environment, and we continually seek new ways in which we can further improve our performance for the benefit of our employees, suppliers & customers and also local community. BMM is ISO 14001:2015 certified through SGS for “Assembly of Handsets & Accessories and Trading of Telephone Component” too. You can even verify our certification here. Improving energy effectiveness and reducing associated carbon emissions where possible. Respecting and adapting to the environment and ensure wise use of natural resources.